You as a Machine. Modified by Rikki Endsley. CC BY-SA 2.0. 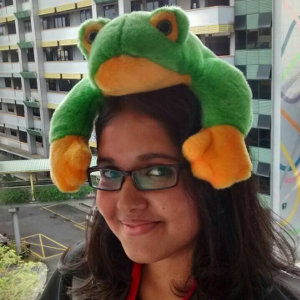 Priyanka Nag is a technical writer for Red Hat and Mozilla Rep from India. Priyanka has been contributing to open source projects for the past four years. She started by editing Wikipedia pages, and then was introduced to Mozilla during an event at her college. She says that Mozilla was love at first sight, and soon after she became a Mozillian, she was hooked on the project. Now Priyanka is also a regular speaker at community events in India. I recently caught up with Priyanka to learn more about her work in the Mozilla Community and her thoughts on the importance of the open web in India. When not hacking on projects for Mozilla, what kind of hobbies do you enjoy? Someone had once told me, "Passion is something for which even if you are woken up at 4am and asked to work on it, you won't mind." For me, writing is that one thing. I am not sure how many people can say that they love the job they do. Well, I am one of the lucky ones who can scream that out loud. I am a technical writer in my profession, and when not hacking on projects for Mozilla, I generally work on different Red Hat documents and am also trying to get started with some of the Fedora project documentations. What inspired you to get involved with Mozilla? This has always been my most favorite question. The answer is simple: People. After I attended my first Mozilla event at my college, I was invited to join the local Mozillians for a MozCafe meetup. It was scheduled on a Sunday evening. I remember my friends mocking me, saying I am too nerdy to be willing to spend my Sunday evening at a tech group meetup. Well, I was also hesitant initially. But once I walked into the cafeteria, it was as if it was a whole different world. It was a world of geeks, for sure, but geeks who were proud to be so. The air was filled with so much enthusiasm and energy. I was surprised to see a bunch of people who were extremely happy to spend a Sunday evening talking about something they were definitely not being paid for. Their enthusiasm gave me the desire to explore Mozilla. And I did! Can you tell me what inspires you to be involved in advocating for the open web? Freedom and openness. Of course these are the key motivations for all open source advocates. The web is no more a luxury; it's now an utility. We can't just let one set of people take control of the web. Also, we are the "smart" generation people who are connected to the Internet 24/7 through our smart devices. If the web is a place where we spend almost of our awake time, it's important that we understand the place well and make sure it's safe for all of us. Why is the open web important for India? India is a developing country. We are still progressing. And progress in today's world can't be thought of without the Internet. There are still millions who are yet to be introduced to the world wide web in this country. It's a sad sight when there are people who consider WhatsApp and Facebook to be all of the Internet. They are yet not aware that an entire web exists beyond Facebook and WhatsApp. This is the reason why an open web is so extremely important in India. We want more people to be able to enjoy the same freedom and power of the Internet that we are using, everyday, every moment. What makes you most excited about the future of the open web in India? Really inexpensive smartphones are now available in India, so more people are experiencing the Internet through their smart phones. The current generation is tech-savvy, and the knowledge and power of the Internet is now spreading like wild fire. Knowledgeable people are taking initiative to spread their knowledge, and people are coming forward to learn. What are the biggest challenges in teaching people about the open web in India? We still have a huge mass of people who do not have access to the Internet. Computers are expensive devices, and of course not everyone can have one. Many inexpensive smartphones are now available, but data is expensive in this country. Many service providers often give some inexpensive data plans that can only be used to send and receive messages on WhatsApp or surf Facebook. The scary outcome of this is the fact that many people are starting to think WhatsApp and Facebook are the Internet. They are still not aware of the immense power of the Internet that exists beyond WhatsApp and Facebook. Are you involved in any efforts to expose more women to opportunities contributing to open source? Yes, I am currently leading the WoMoz (Women in Mozilla) project in India. I am aware of the sad state of men vs. women contributor ratio in the open source world, and it always hurts to see it. I could never find one valid reason for this status. Women have proved, several times, to be equal to men in different domains. Sometimes, all that we need is a little support and encouragement from our fellow workers, and that is what we are trying to give through the WoMoz project, both globally as well as here in India. Is it rewarding to contribute to Mozilla? Can you explain how? What kind of tools are you using in the work you do? I work at Red Hat, so it's needless to say that all the tools we use here for our work are open source tools. I use both Fedora and RHEL (Red Hat Enterprise Linux) for my work, and of course my default browser for years has been Mozilla Firefox. I also use Thunderbird to manage my emails. What makes you most excited about Mozilla's mission? Mozilla's mission is not only to keep the web open and maintain the health of the web, they also strive to create opportunities on the web for everyone. This is what excites me most. The web is for everyone, not only to use it and consume it—they can also give back. With the Webmaker project, Mozilla is trying to make sure that everyone understands what the web consists of, and also to realize that it's not difficult to build something beautiful on the web. If people wanted to meet you, what events are you attending in the upcoming months that they might attend? Well, I don't have a plan as of now but I am generally found at different Mozilla events, and other than that, this year I am also planning to attend Open source Bridge in Portland, and FUDCon in Pune, India, both in June. This article is part of Benjamin Kerensa's Open Web column, where he delivers the latest on what is happening in the open web, interviews with contributors to projects working on the open web, and his own perspectives on current open web news and events. This a great story, Priyanka - you are doing some awesome work! Thank you for sharing. She is pretty amazing I look forward to hearing her talk at Open Source Bridge this month in Portland.